There are different ways to get rid of your student loan debt. You can either earn more money or spend less money, and then put that cash toward your monthly debt payments. But we’re betting you’ve already tried that approach. If you want to get out of debt sooner or lower your monthly payments, refinancing your student loans might be a good option. Refinancing is when you replace one loan (or a set of loans) with one, new loan at better terms. Maybe it has lower interest rates or a longer term length. Either way, the goal is to make your loan fit with your current financial goals better. If you’re wondering whether refinancing your student loans is the right move, it’s important to get the best interest rates possible — here’s how. First things first: Should you refinance? If you refinance your federal student loans, you’re essentially replacing them with a private student loan. Private student loans generally come with fewer protections. You won’t be able to get Public Service Loan Forgiveness (PSLF) anymore, for example, or income-driven repayment plans. That doesn’t mean you need to toss out the whole idea entirely. But it does mean you do need to consider what you’ll be giving up. For many people, refinancing federal student loans does make sense, but for others, it doesn’t. The biggest reason most people refinance their student loans is to get a lower interest rate. This makes the cost of your loan cheaper overall. And if you pair it with the same (or shorter) loan term, you can really get a one-two punch that’ll let you 1) get out of debt sooner, and 2) pay less interest over time. Of course, your monthly payments may be higher as a result. Here’s an example of how this works: Let’s say you have $150,000 worth of student loans at a whopping interest rate of 10% APR. If you refinance that rate down to 5% APR with a 10-year repayment plan, you’ll save $46,953. Not bad! Your refinanced loans will either be at a fixed or variable rate. Variable rates are usually cheaper than fixed rates at any given time but can increase over time, sometimes becoming even higher than if you’d gotten a fixed rate. Although they may provide short-term savings, they’re a bit riskier in the long run. If you plan on paying off your loan quickly or don’t mind the risk (you can always refinance again if rates head north, after all), then a variable rate loan might make sense for you. But if you’d rather have the peace of mind that your interest rate (and thus your monthly payments) won’t change, then a fixed rate loan can help. You might be having a hard time making your monthly student loan payment at the standard 10-year plan. Federal student loans offer income-driven repayment plans. But if you have private student loans, your lender may not be as willing to work with you on your payments. Refinancing your student loans can be a way around this. Getting a lower interest rate may help lower your monthly payment, but extending your loan term can also help. This spreads out your repayment over more months so each monthly payment is more manageable. There are definite pros and cons to this strategy. Namely, it could be more expensive in the long run. But if you need payment relief now and your lender’s not giving it to you, refinancing for a longer term length could be one way to get an affordable payment plan. If you really can’t stand your current loan servicer or lender (and we can’t blame you), refinancing your student loans can be a last-ditch effort to get away from them. But even then, it’s not a fail-proof option. That’s because not all private student loan lenders handle repayment for their own loans. They may outsource payment management to a third party (i.e., a servicer) who — surprise — may be an offshoot company of the one you’re trying to get away from. So you’ve decided refinancing your student loans is right for you. Great! Here’s how to get the most out of the process so you can reach your financial goals sooner. Federal student loans are all doled out at the same interest rate, depending on what type of loan you get. Not so with private student loans. Private lenders base your interest rate on several factors, the most important being your credit. If your credit score isn’t strong, you won’t qualify for the best rates on your refinanced loans. Check your credit score on a site like Credit Karma or Chase Credit Journey. These sites provide a VantageScore, which is generally a close approximation of the FICO score lenders use. Some credit cards, such as Discover cards, also provide a free monthly update of your FICO score. You’ll also want to look at your credit report. You can get a free report every year from each of the three credit bureaus (Equifax, Experian and TransUnion) from AnnualCreditReport.com. This provides you with the information that’s used to generate your credit score, so it’s important to scope it out thoroughly and make sure there are no errors. According to a report from the FTC, five percent of credit reports had an error that could affect your credit score. If yours is one of the unlucky ones, now’s the time to dispute the error and correct it before applying for refinancing. You won’t need any official documentation just to shop around for refinancing offers. But it’s a good idea to at least provide accurate information when you do shop around so you can get the most accurate estimates. Keep in mind that each lender is different and may have other requirements as well. The easiest way to start shopping around for the best interest rates is by plugging your information into a site that lets you compare multiple refinancing offers. You can also check if your bank or credit union is offering competitive refinancing rates. Each time you check your rate, the lender does what’s called a “soft credit check,” which doesn’t show up on your credit report. Feel free to check your rate with as many lenders as you want without fear that it’ll impact your credit. It’s also a good idea to record what (if any) fees are associated with the loan. Some lenders charge an origination fee, which is an up-front fee that’s tacked onto your loan. Another fee to watch out for are late payment fees. You may not be planning on making any late payments, but it’s also a good idea to note any late payment fees just in case. Make sure to keep track of what offers you receive so you can compare them when you’re done. A great way to do this is with a spreadsheet, a Word or Google doc, or just pen and paper. Now that you’ve collected all of your quotes, it’s time to pick the winner. Which lender you choose depends on what your goals are with refinancing. If you’re looking to get the cheapest rates possible, then pick the lender with the lowest rate quote. If you’re looking to extend your loan term so that your monthly payments are more manageable, pick the lender with the monthly payment amount that fits your budget. Once you have a top lender (and their offer) picked out, run some numbers to make sure you’re really getting as good of a deal as you think. Refinancing can help lower your interest rate and/or your monthly payment, but at what cost? For example, if you extend out your payments by very long, you’ll owe far more than you do now in interest by the time you pay off your loan. You may decide that cost isn’t worth it. These long-term costs (or savings) may be eye-opening to you and affect your financial status potentially for years to come. We’ve put together a simple refinancing calculator you can use to check any potential offers out for yourself. If any of the loans you’ve scoped out have origination fees, it’s also important to add this cost onto the loan. For example, if you use the calculator above and find out you’ll save $500 but there’s a $1,000 origination fee, that means you won’t actually be saving any money at all. You’ll come out with $500 less in the end. 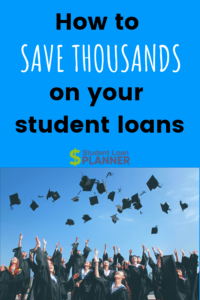 At Student Loan Planner, you can get cash back when you refinance your student loans. But we don’t recommend choosing your lender based on a refinancing bonus alone. Instead, choose a lender that’s right for what you’re looking to accomplish. If that happens to be one of the lenders we work with, you can add a bit more money to your bottom line. Do you care about getting top-notch customer service? Or would you rather just get the lowest rate possible, even if it’s with a company that scores poorly with customers? Now that you’ve chosen a potential lender, it’s time to thoroughly vet the company before you sign on the dotted line. Make sure you take some time to check out customer reviews of the company or any special programs that may be of interest to you. Some lenders offer forbearance options, for example, or programs like career coaching. The next step is to complete a formal student loan refinancing application with the lender. Since you’ve already gotten your paperwork in order from the earlier steps, applying online should only take a few minutes. Keep in mind that each lender has slightly different application requirements, so stay tuned to your email and phone in case the lender contacts you. After submitting the online application, the review process could take a few weeks to complete. In the meantime, keep paying your current lender until you get the green light for your new lender to start making payments to them. Refinancing may be a great option for you to lower your monthly payments, pay off your loan faster or even both. It’s not without its risks (especially if you’re refinancing federal student loans), but if you take the steps above, you’ll have done some research to find the best option for your needs. If you need help deciding whether refinancing your student loans can help you, feel free to connect with one of our student loan specialists.